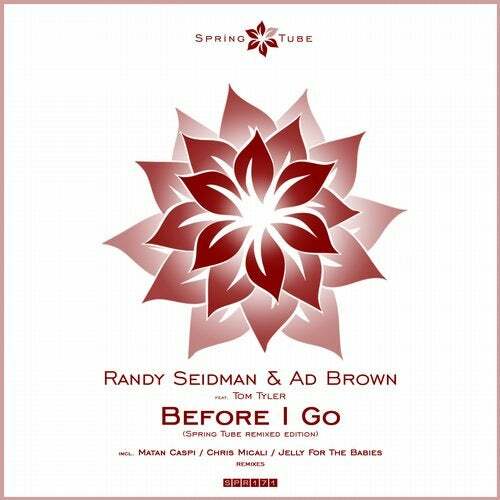 Next up on Spring Tube is our remixed edition of the "Before I Go" track by Randy Seidman and Ad Brown feat. Tom Tyler. This track was released a week ago on our sister label Round Triangle as an original single with the remixes by Eitan Carmi and Mistol Team. Now we present the pack with Spring Tube's remixes on this theme. The first remix is by one-and-only Matan Caspi from Israel who has releases on such a respectable imprints as Global Underground, Kontor, Spinnin', Pacha, Baroque, Armada, Black Hole, Enormous Tunes, Unreleased Digital, and of course his own Outta Limits which he runs together with his production partner Stan Kolev. Matan's music was supported by many top DJs worldwide most of whom have also licensed it for their CD compilations, among them are Above and Beyond, Eric Prydz, Tiesto, Ferry Corsten, ATB, Sander Van Doorn, Andy Moor, Sander Kleinenberg, Jerome Isma-Ae, Robbie Riviera, Joris Voorn, Eelke Kleijn, Manuel De La Mare, Avicii, Daniel Portman, and others. Caspi's remix on "Before I Go" for this our package is his another masterpiece for sure! Secondly we have here the legendary American producer Chris Micali [Bedrock, Vapour, Flow, Curvve, Fade, Release Records, Aurium, Witty Tunes, Commonwealth] who prepared for this our remixed edition as many as three versions! Each of his interpretations offer something own - from happy progressive and house to more tech and dark sounds. And all of them will rock any dancefloors without doubts! Finally, for completing this pack with some deep version we have here already featured earlier on Spring Tube artist - Jelly For The Babies from Serbia. Expect more from this talented producer on our label in 2016 but for now estimate his great remix for this our release.